From the Helm . . .
As I write this, there are several items of interest for our captains. Back in late December of 2018, House Bill 1145 was up for a committee vote by Michigan’s legislators. The bill would have put the state’s lake trout into commercial status, allowing for harvest by commercial net fishing operations. Thanks to opposition from our captains and other sport fishing organizations, our legislators tabled the bill. We will see where it goes in 2019. On March 5, I attended the Lake Huron Citizens Fishery Advisory Committee meeting in Clare. Some brief highlights included the discussion of four stocking sites for roughly 96,000 Coho salmon this spring. Cormorants and the problems associated with them have stalled. As of right now, USFW is in a “discovery mode” and not much is happening at their level. Over 700,000 Cisco were planted last fall in Lake Huron. A discussion to extend the commercial permit for the harvest of white fish from Harbor Beach south drew a lengthy discussion. Reports from anglers and fisheries biologists indicate the Saginaw Bay walleye fishery is still strong for the near future. Another bright spot is Atlantic salmon fishing in streams, rivers and the big lake is gaining more steam every year. Let us hope this fishery continues to grow. Atlantics are a great game fish for our industry. On the Lake Michigan side, Grand Traverse Bays are in the spotlight over lake trout harvest in 2018. Vice President Capt. Bill Winowiecki will have a complete report in this issue of the Cannonball. Capt. Bill and our Northern Lake Michigan director, Capt. 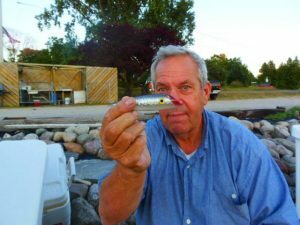 Tony Radjenovich, have worked many phone hours on the lake trout catch numbers issue in Grand Traverse Bay regarding the Consent Decree and Total Allowable Catch. Up here in Northern Michigan, it looks like we are finally going to get a taste of spring temperatures. Captains I talk to around the state are anxious to be on the water again. Reports from fisheries people and knowledgeable anglers I talk to think the fishery should be as good as or better than 2018. If weather conditions are favorable this spring, I am looking for a good offshore steelhead fishery. I know, I said that last year, but let us hope this year the weather cooperates and provides some exciting offshore steelhead action. Lake trout numbers were WAY up for charter clients, too, by the way. They really help fill the cooler when salmon fishing is slow. Lake Erie walleye continue to be a “Gold Star” in the Great Lakes, as that fishery just gets better and better every year. Our captains down there report strong numbers of clients looking for walleye charters. The yellow perch action in the fall is just as good. It is always great to hear of positive fishing news in our state, as we sometimes hear quite the opposite. Finally, on March 20 I will attend the Michigan State University Annual Scholarship Banquet in Lansing. The MCBA Denny Grinold Scholarship Fund awards two $1,500 scholarships to two of MSU’s top underclassmen pursuing a degree in fisheries management. Many of these future graduates will soon work in the state’s fishery programs. 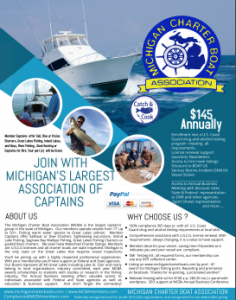 Have a great 2019 season captains, and the Board of MCBA and I wish you all a safe and successful season.